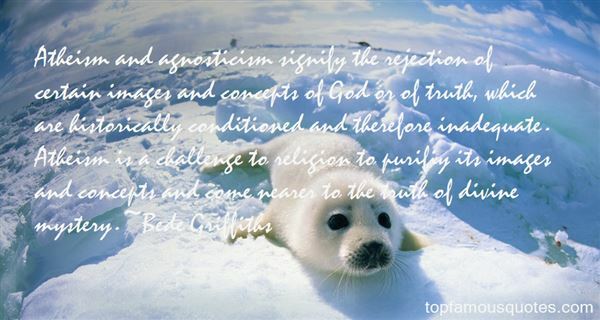 Reading and share top 17 famous quotes and sayings about Agnosticism by famous authors and people. 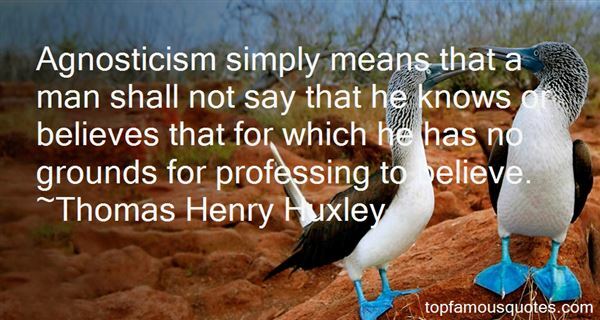 Browse top 17 famous quotes and sayings about Agnosticism by most favorite authors. 1. "My religious beliefs also defied convention, leaning towards agnosticism and pandeism." 2. "Agnosticism has nothing to impart. Its sermons are the exhortations of one who convinces you he stands on nothing and urges you to stand there too." 3. "Generations of Humeans have… been misled into offering analyses of causation and of natural law that have been far too weak because they had no basis for accepting the existence of either cause and effect or natural laws… Hume's scepticism about cause and effect and his agnosticism about the external world are of course jettisoned the moment he leaves his study." 4. "Atheism and agnosticism signify the rejection of certain images and concepts of God or of truth, which are historically conditioned and therefore inadequate. Atheism is a challenge to religion to purifiy its images and concepts and come nearer to the truth of divine mystery." 5. "I oscillate between agnosticism and atheism." 6. "Let's face it: suffering discredits goodness. I'm agnostic in practice though faith-based in theory. I used to pray but now know he'll do what he darn well pleases when he darn well pleases. Will he listen? Maybe. We have a book that says so, but how much happens beyond that book, I can't say. That's agnosticism in its bleakest and most honest form. Don't judge me, yet believe me when I tell you that years of abuse tend to wring out every ounce of one's ability to understand and adhere to faith in standard form." 7. "I do not consider it an insult, but rather a compliment to be called an agnostic. I do not pretend to know where many ignorant men are sure - that is all that agnosticism means." 8. "People are invariably surprised to hear me say I am both an atheist and an agnostic, as if this somehow weakens my certainty. I usually reply with a question like, "Well, are you a Republican or an American?" The two words serve different concepts and are not mutually exclusive. Agnosticism addresses knowledge; atheism addresses belief. The agnostic says, "I don't have a knowledge that God exists." The atheist says, "I don't have a belief that God exists." You can say both things at the same time. Some agnostics are atheistic and some are theistic." 9. "If you describe yourself as "Atheist," some people will say, "Don't you mean 'Agnostic'?" I have to reply that I really do mean Atheist. I really do not believe that there is a god - in fact I am convinced that there is not a god (a subtle difference). I see not a shred of evidence to suggest that there is one. It's easier to say that I am a radical Atheist, just to signal that I really mean it, have thought about it a great deal, and that it's an opinion I hold seriously. It's funny how many people are genuinely surprised to hear a view expressed so strongly. In England we seem to have drifted from vague wishy-washy Anglicanism to vague wishy-washy Agnosticism - both of which I think betoken a desire not to have to think about things too much." 10. "It is not scientific doubt, not atheism, not pantheism, not agnosticism, that in our day and in this land is likely to quench the light of the gospel. It is a proud, sensuous, selfish, luxurious, church-going, hollow-hearted prosperity." 11. "Thus, as far as he is a scientific man, as far as he knows anything, he is a materialist; outside his science, in spheres about which he knows nothing, he translates his ignorance into Greek and calls it agnosticism." 12. "He had remained steadfast in agnosticism and therefore, as Mabel took comfort in remarking, 'he never denied God.' Neither did he affirm God." 13. "Skepticism is my nature. Free Thought is my methodology. Agnosticism is my conclusion. Atheism is my opinion. Humanitarianism is my motivation." 14. "I went with agnosticism for a long, long time because I just hated to say I was an atheist - being an atheist seemed so rigid. But the more I became comfortable with the word, and the more I read, it started to stick." 15. "America's freedom of religion, and freedom from religion, offers every wisdom tradition an opportunity to address our soul-deep needs: Christianity, Judaism, Islam, Buddhism, Hinduism, secular humanism, agnosticism and atheism among others." 16. "This deep agnosticism is more than the refusal of conventional agnosticism to take a stand on whether God exists or whether the mind survives bodily death. It is the willingness to embrace the fundamental bewilderment of a finite, fallible creature as the basis for leading a life that no longer clings to the superficial consolations of certainty." 17. "Agnosticism simply means that a man shall not say that he knows or believes that for which he has no grounds for professing to believe." And let her think I don't care she's with you? No can do. She needs to know what I want"